My favorite things about summertime: tie-dying my t-shirts, never wearing socks, getting a sandal tan, going on camping trips (and inevitably eating s’mores). My favorite things about summertime in DC: getting into air conditioning, “taste-testing” everything my roommate barbecues, and, obviously, eating popsicles. With a beautifully windy and perfectly hot July Fourth last week, we have officially entered the summer-zone, a time we DC-ers anticipate equally with glee and dread. At Pleasant Pops, we’re pretty pumped that our season is finally here; a time to indulge in a pop (or two or three) every day, guzzle down some cold-brew ice coffee, and enjoy the crunchiest, totally refreshing pickles from No. 1 Sons along with our bbq. As a brother-sister team, Yi Wah and Caitlin began pickling and fermenting vegetables in Arlington, VA a few years ago. Taking a strong message from their mother, or “Number 1 Mom” as they lovingly refer to her on their website, these siblings operate on a philosophy that simple ingredients, traditional processes, and carefully combined flavors can make a dynamite product, and they’re right! Though pickles and kimchi may not share similar culinary histories, it made sense for the Chinese-Irish siblings to delve into all things fermented. From their website (http://number1sons.com) it is clear how dedicated to fermentation No. 1 Sons is, explaining in depth the health (and taste) benefits of fermentation (how their methods produce delicious, constantly-changing and totally safe pickles, krauts and kimchis). Even though there are several spots around DC, Maryland and Virginia that happily sell No. 1 Sons, they have kept up a strong presence at local farmer’s markets, offering samples of most products and a giant green pickle as a mascot. The two varieties of pickles that No. 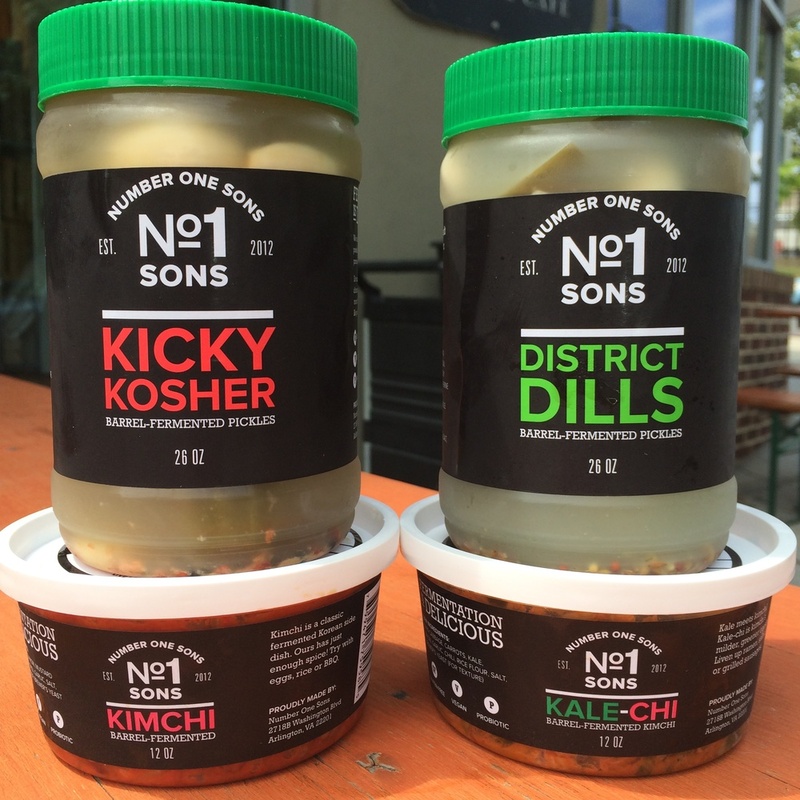 1 Sons makes are the “District Dill” and the “Kicky Kosher,” both totally gluten-free and vegan, and pickled without any vinegar. To read the ingredients in each batch of pickles is encouraging: cucumbers, water, and some thoughtful herbs and spices. Nothing else. Because the cucumbers are naturally fermented, the brine turns cloudy (“proudly cloudy”). Consumers are reminded on each jar to “[e]at sooner for fresh taste and ultimate crunch. Like wine or cheese, more character comes with more time,” telling us that fermented goods won’t expire, just evolve. And then there’s the kimchi. No. 1 Sons produces not only a fantastic, more traditional Korean kimchi with napa cabbage, daikon, mustard greens and a few other ingredients but they’ve adapted the classic recipe for our modern trends in their tasty “kale-chi.” Using similar techniques, the kale-chi is a milder version, using kale and carrots to soften the tang, while keeping the benefits of fermentation. As all their products contain live cultures, it’s important to keep them refrigerated (you can find them on the top shelf of the Pleasant Pops cold case). So grab your tie-dyed t-shirt from summer camp, take off your flip-flops and pile up the kimchi for what is bound to be a hot, rainbow-filled, deliciously crunchy summer.